Soap Grater Makes Better Use Of Bar Soap | OhGizmo! There are many of us who are rather fond of bar soap. One of the biggest problems with this form of soap is that there is always a tiny piece of it when you’re almost finished. That piece is also almost impossible to use. Can you imagine if bar soap were just as easy to use as liquid soap? Not to mention that this would also be more eco-friendly than liquid soap as well as it would use every bit of it. Natalie Staempfil has designed a hand-pumped soap grater that has the soap sitting upright and will gradually sink down as you use it. How awesome that you not only get to use all you’re bar soap to the last shred, but you’re actually saving money because of it? This thing needs to be on the market right now! Whoever is out there reading this, and has the power to do something about it, make sure this thing happens. 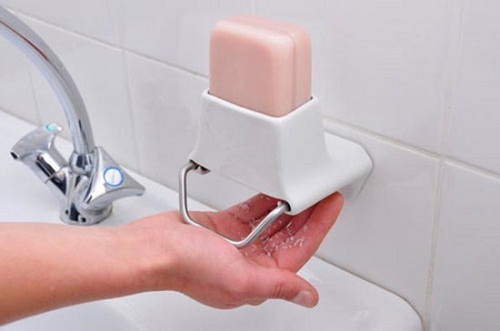 This is certainly very useful than using a liquid soap. Even ordinary household need this to get the most out of their soap bars. This will of course be an awesome product to manufacture. Interesting, but are there any limits on size? shape? Texture? Less processed lye based soaps might be too soft for this, smaller or the more commonly curve-shaped bars might not fit quite right.